Oops…was it a mystery or memory block? The “mystery” from last time was actually solved a few years back. My mom reminded me that we confirmed the identity of the priest when we compared the photo-pin to a photograph of Father John J. Molloy that we found in the book Meet Shieldsville, by Mary L. Hagerty. I spaced this discovery out, and I must admit that this was not entirely an accident. At times I become overwhelmed with my own family history research, and when a discovery opens up a new can of worms and I don’t have the time or energy to deal with it, I will slip the cover back on and vow to deal with it at a later date. This is precisely what happened with good old Father Molloy. 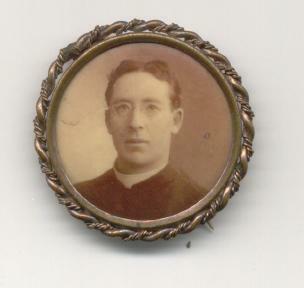 Above is a reproduction of the photo of Father Molloy. It is not of the highest quality, but I think you can appreciate the resemblance to the photo-pin on the right. My great-grandmother worked as Father Molloy’s housekeeper (1905-1910) before she was married. While I was pleased to learn the identity of the priest, it meant that there was even more to learn about Father Molloy. The first thing I wanted to know was how Annie came to know Father Molloy. John J. Molloy was born in County Mayo, Ireland and educated at St. Patrick’s College Maynooth, County Kildare. He was ordained in 1891 and arrived in Minnesota later that year. Father Molloy served as an assistant pastor for a number of parishes throughout Minnesota before settling at St. Patrick’s in Shieldsville. He served the community for fifty-two years. All of that was well and good, but I couldn’t find anything in the biographical information on Father Molloy that could point to a connection to my great-grandmother. That was until I read in his obituary that he was survived by one sister named Delia in Manchester, England. Immediately I thought of the dozen or so photographs taken in the studios of Manchester, England that Annie had saved. Of course, none of the photographs were identified, but I assumed they were of family members. Annie had one sister who moved to Manchester and raised a family (Bridget) and another sister who lived there for a few years before returning home to Kildare (Catherine, who I have mentioned before.) Manchester could be the connection, but it made my head hurt and I told myself I would tackle this another day. I believe the day has come. It is time to dust off my Manchester file and see if I can’t figure this one out. 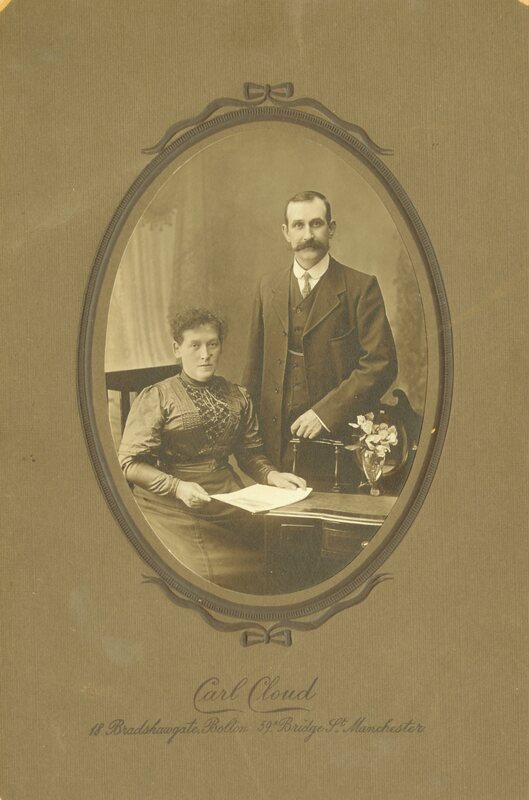 A wonderful book, The Reynolds Letters, provides considerable insight into the lives of Irish emigrants living and working in Manchester during the 19th and early-20th centuries. I will use the resources available on ancestry.com and elsewhere on the internet to see if I can learn anything more about a possible Molloy-Hill connection in Manchester. Perhaps Annie's sister and family? Categories: Where they went | Tags: emigration, Fr. Molloy, Hill, Ireland, Kildare, Kill, Maynooth, Mayo, Shieldsville | Permalink. Thanks, Trish! This was great…I must get back to County Mayo! Any luck with reconnecting to the Lavelle Pub? Are you still planning a trip to Ireland in the Spring? Thanks again for sharing the video! Information on a brother to Father Molloy, Thomas Anthony Molloy, was married twice. Catherine Cecelia Kelly was the second wife to Thomas . He immigrated in 1893 and married the first time in 1895 at age 20. In 1930 he was a ticket agent for the Railroad, rapid transit…. I am related to one of your writers, Dorothy Blackmon. She was my mother’s godchild and my second cousin and I have tried to get a written answer from her about her side of the Molloy’s also. 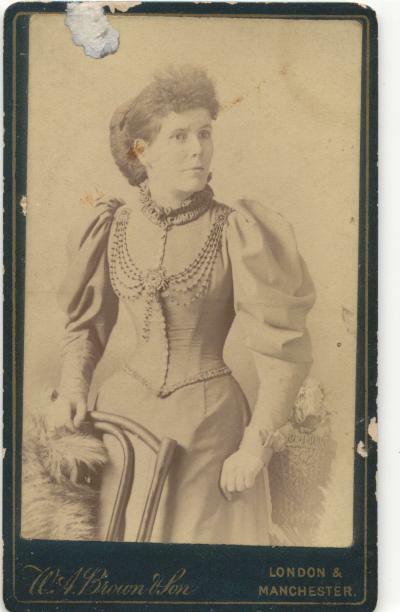 Catherine Kelly was my grand aunt and I am trying to fill in my family tree along with some really great Kelly cousins, Dorothy, we have some pictures we can share and would like some from your side.. I appreciate all that you do and it’s a wonderful task to be able to fill in the blanks! This has been a valuable asset to me. I also own the “Meet Shieldville” and it is not perfect, remember. There are some things that are not correct, but for the most part and great volume to own. It holds most of my ancestors! Very blessed to find you! Trish — Thanks for stopping by and commenting! I have not heard back from Dorothy, but will try again. It is definitely nice when you can connect to others interested in the same families. Do you know where the Kellys came from in Ireland? I just returned from two weeks in Ireland, and met several Kelly relations on my father’s side. One has written a book on his Kelly family. Do you currently live in the Shieldsville area? I will keep in touch and see if I can touch base with Dorothy. Thanks again! I am tracing a family mystery which has lead me to the Mulloys/Molloys of Keel and I have some info about them. 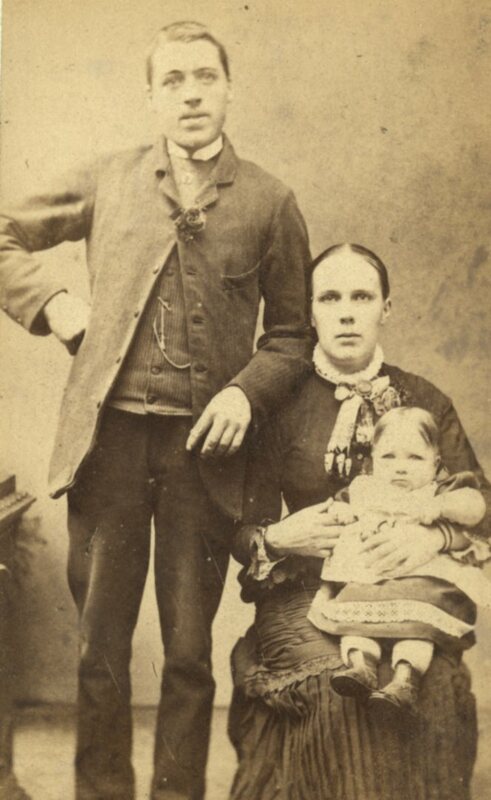 A relative of mine (Grnadfather’s cousin) named Mary Healy lost her mother at childbirth around 1888. The mother was an Anne Lavelle from Keel and Mary Healy appears in the 1901 census aged 13 with the Lavelle family. Mary then married a Molloy from Keel and a Mary Molloy aged 23 appears in the 1911 census with her husband Andrew , son of Anthony, brother of Rev. JJ and Anthony and uncle of Steven mentioned above. I was wondering can any of you confirm that that Mary Molloy aged 23 in 1911 is the same Mary Healy aged 13 in 1901? Thanks so much for your comment. It sounds like the same family to me. I have not heard back from the Molloy who commented on this post earlier – I hope she gets in touch with me again. I think I will send her another email with the information you provided. Is Mary In Keel in 1911? Did Mary and Andrew remain in Ireland? Thanks again for the comment, and I will keep you posted on anything I learn from the Molloy connection! I am a Molloy. My grand father is Thomas Anthony Molloy from Keel Achill- County Mayo. Father Molloy was his brother. I have been trying to get information about my grandfather for awhile. All I know is that he was born in Achill around 1880 or so, We have no idea when he came to America. I haven’t found any other info on him in Chicago. We do know he died when my father was only 5. So that would be around 1933. He had a store in Chicago. My father’s mother was Katherine/ Kate Kelly from Shieldsville. – Hence knowing Father Molloy.My father is John Joseph Molloy born in Chicago in 1927. My sister Patty Molloy and I were in Achill July 2009 and found out about Anthony Mulloy and Elizabeth White. Anthony was another brother of Father Molloy, Thomas, Patrick and Andrew. Anthony Mulloy the one brother had 7 children. one of which is Steven from Cleveland who has a deep connection with Achill and Ohio and Brenda Mulloy is from Manchester. We have other information that another sister named Margaret ( spouse Mike Sweeney is from Manchester aslo) Anyway there are many cousins. I am interested in how you got your information. I have tried Ancestry.com but did not get far with my grandfather and it was very time consuming. Let me know if you have any suggestions. It would be greatly appreciated. I was thrilled to see your comment, Dorothy! I have a few questions for you, so I will send you an email directly. Ancestry is great, but I find that I spin my wheels when I don’t luck out and find the right information early on. Have you tried to look at the church records from St. Patrick’s in Shieldsville to locate info on your grandfather? Does he appear in the Federal Census – 1930, 1920, 1910? Have you ever looked at Chicago city directories? 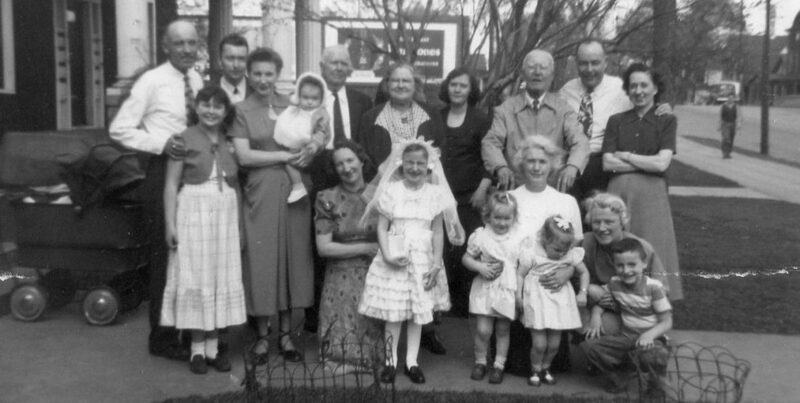 I have a great little book “Meet Shieldsville” from the 1950s that includes family histories. There is a bit about Father Molloy, and several Kelly families, but no mention of Kate Kelly or your grandfather. My great-grandmother Annie Hill Regan worked as housekeeper for Father Molloy before she was married for close to ten years. Later in the 1920s, she filled in as housekeeper for him in Shieldsville during the summer. My grandfather accompanied her one summer and served as Father Molloy’s driver. That was probably in the late Twenties. I will email you with more questions…so much information! Thank you so much for getting in touch! Happened across this blog post while looking for old photos of A. Mulloy’s pub in Keel. Don’t know if you’re still looking for answers 2+ years later, but maybe I can help. My wife is the daughter of Stephen Mulloy who was born in Keel in 1933 to Anthony Mulloy and Elizabeth White, emigrated to Cleveland in 1954 but kept close ties with Achill. We go back every year to visit family that is still around, and both the Ireland/England bunch and Cleveland bunch are all very much into ancestry – visiting graves is a must on every trip, and there is a reunion every 5 years (next one is summer of 2015). Two weeks ago when we were in Achill we spent time with Margaret Sweeney of Manchester, who was also there on holiday. Long story short, I know people that can give you the answers you want regarding Mulloys and Molloys of Achill. You are probably on their family tree already if you’re that closely related. If by some chance you actually see this, feel free to get in touch with me via the contact form on my website at stg.io and I’ll put you in touch with the right people. Hello, It is Dorothy Blackmon. Formly Dorothy Molloy. I contacted you several years ago and never heard anything back from the Stephen Mulloy family. My husband and I have been to Achill several time. My grandfather is Thomas Anthony Molloy and Father is John Joseph Molloy. Father Molloy is Thomas Anthony Molloy’s brother. Thomas Anthony Molloy died in July 28, 1934 in Shieldsville, Mn and listed on the death certificate is Mother: Bridget MCCaffery and Father Anthony Molloy. Spouse is Catherine C. Kelly They were married in Shieldsville on July 2, 1923 and Father John J Molloy performed the ceremony. Catherine C. Molloy died on April 11, 1937 . My father John Joseph Molloy was born in Chicago on Nov. 24, 1927. He spoke of his father and mother often. He was raised in Minneapolis by Catherine Kelly’s sister Evelyn Kelly O’Connell. My father John Joseph Molloy married Marjorie K, Olson. They had 9 children. Patty Molloy my sister married Marty Steyer and Tommy Molloy and Elish attended the wedding. I remember Sean Mulloy visiting our house in Hopkins, Mn when I was young. Back to more recent time. We have stayed at the Bervie Several times and Elizabeth White and John Barrett have been helpful. My father and mother have traveled to Ireland and often talked about relatives in Ballinrobe, Achill , Dublin and Manchester. We went to Shieldsville as children and they showed us St. Patrick”s church where Father Molloy was a priest. Some of my siblings met Father Molloy because they are older than I am. 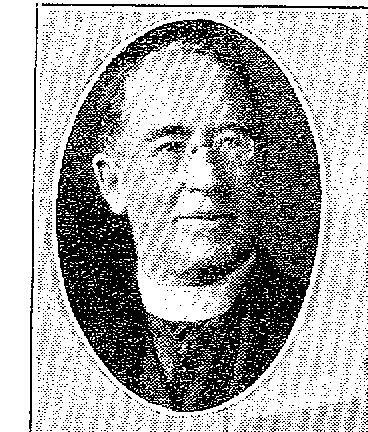 Father Molloy passed away in 1962. My father John J Molloy son of Thomas A Molloy always said that Father Molloy and Thomas were brothers. Yet when I met with Eilish and Mary T Quinn Griffin in Dublin June of 2014 and Eilish said Father John J Molloy and Thomas A were not brothers. Everyone on Achill says they heard of Thomas A Molloy but didn’t know what happened to him. I think it is strange to say the least and sorry but I believe my father who spent time with Father Molloy in MN and also with Kelly relatives in MN. I would greatly appreciate any tree you have as a family. Eilish and Mary never have shared it with me or my sister Patty Molloy when we have asked. Your response would be greatly appreciated. I am glad you solved the mystery. Good job!